1895-1918: Trieste is placed at the border between Italy and Slovenia (click here to see the map) and in the past was part of the Austro-Hungarian Empire and of Italy. The very first license plates were issued probably in 1895 and were Austro-Hungarian: they were rectangular, with one or two lines, respectively for front snd rear plates, and had the letter K (Kustenland), likely in black, followed by a black serial number of three digits (picture number 1). In some cases there was a roman number from I to IV placed between the K and the number (the plates KI 296, KII 332 and KIII 312): it showed the thousand or, if you want to be more precise, the series, where each series had the numbers from 001 to 999 (picture number 2). 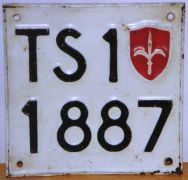 1918-1922: In 1918 Trieste became Italian and the plates had a history like those in Trentino: at the beginning there were some white provisional plates, with the red letters TRI for the use in the city and VG (Venezia Giulia) in the surroundings (picture number 3), and then in 1922 the province of Trieste was created and plates became like all the normal Italian plates of that time, with the number 74 in red (see the table of codes). Also these plates could have a roman number between the code and the number with the same meaning as in the previous plates and in this case the plates VGI-5 and VGII-291 are known. Unfortunately I haven't got any picture of TRI plates yet. 1948-1956: After the Second World War, from 1945 until 1954 Trieste was divided in two parts: part A was occupied by American and British forces, while part B was Yugoslavian. In 1954 part A was given to Italy, while Yugoslavia took part B. Plates of part A were issued with numbering system in Italian style: in 1948 (the new PRA, Department of Motor Vehicles, of Trieste was created on 1/1/1948) all Italian plates were converted in these new plates, probably restarting the numbering, and then back to Italian plates in 1954 (? ), but this time keeping the same number. The rear plates were made of metal, their size was 32x22 cm. 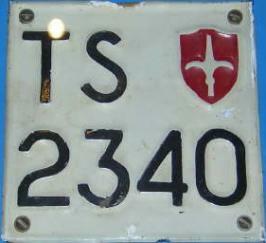 up to 1952 and then became 27.5x20 cm., they had the letters TS for Trieste on the upper left corner and on the right there was the shield emblem; on the contrary, front plates were made of just one line with the letters TS followed by the number and then by the shield emblem (pictures number 4 and 5: notice that they are a matched pair!). If the number had just 4 digits, they were all placed on the bottom line (click here to see a picture), while the first was placed on the top if it had 5 digits, as you see in picture number 4. The numbers up to 0700 were reserved for the use on vehicles for military authorities. Plates of motorbikes were very similar, but square, as you can see in the sixth picture. Like plates for cars, they had the first digit on the first line if they were five: click here to see a photo of it. Giorgio Grisilla and Dennis Tarlao wrote me that the trucks had a plate with a little A after the letters TS (picture number 7) with the numbering system that started from "TS A5001", while busses and cabs had plates with "TS Hxxx", with the number that likely reached at least 500 (pictures number 8 and 9, respectively a front and a rear plate). Also these vehicles changed their plates in 1954 (? ), but they couldn't keep the same plate number as it was not compatible with the Italian numbering system. It's possible to find the full picture I took the details of these plates from in the old photo gallery (picture 20). 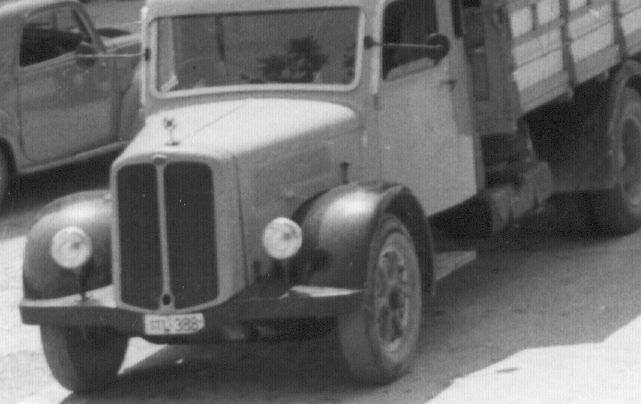 Moreover the plates for trailers had the letter R before the number: I haven't got any picture yet, but Dennis Tarlao found a vehicle with the plate "TS R347" in the archives of "Azienda Comunale per la Navigazione e gli Autoservizi" of Muggia. 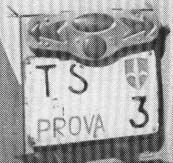 Picture number 10 shows a test plate from Trieste and it also has got a typical coat of arms, while the picture number 11, taken probably in 1952, shows a provisional plate and you can notice that it's like all the other normal Italian provisional plates. 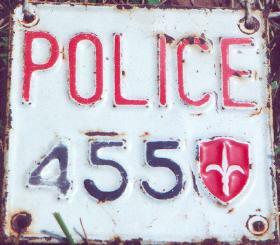 The police of Trieste was under the control of the American and the British forces with the name "Venezia Giulia Police Force": for this reason the plates had the English word POLICE in red, as you can see in the pictures number 12, 13 and 14 (notice that pictures 13 and 14 have two different styles of the characters). 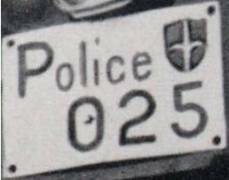 The motorcycles of the police had also a front plate with only the print "Police", but without any number: a picture of them is available in the old photo gallery (picture 34). 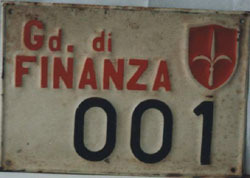 Also the Guardia di Finanza (Custom authority, pictures number 15 and 16: notice that they are the matched couple of the plate 001!) 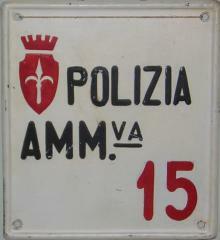 and the Polizia Amministrativa (POLIZIA AMM.va, the local police, picture number 17) had special plates with the typical coat of arms of Trieste. On the other hand, the Port Authority was not a military group and for this reason it had normal plates of Trieste, even if with the number in the block up to 700 reserved for civil authorities. Very likely the year 1954, that you find in many books, is only "conventional" because in that year the agreement to join the part A to Italy was made. Actually these special plates of Trieste kept been issued for a few more years. 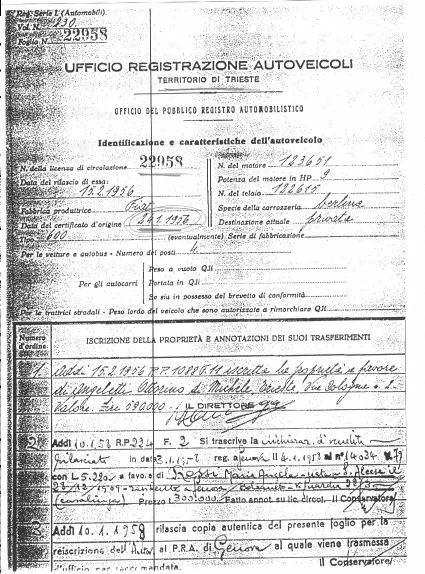 Guido Bevegni sent me a proof of this: it's a copy of the registration at PRA of the Fiat 600 (note that this car was made in 1955) with the plate number TS 22958 issued in 1956 and in this document you can read "Territorio di Trieste" (Territory of Trieste). Click here to see an image of this document. In these years Trieste had also a special international oval for its vehicles with the letters TS. Plates in part B had the format STT * 0000, where * was a small red star. But these are not Italian plates and so I don't include them in this page! Anyway if you want to see a picture of it, though not very good, click here. 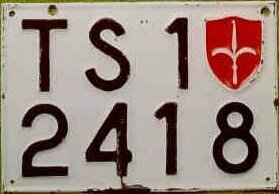 Jugoslavian plates were used also in 1945 during the Jugoslavian occupation: they had the letters KMT (Komanda Mesta Trst) followed by a red star and the number. The first picture is taken from the book "ALBA automobilwerke Triest 1906-1908" by Andrea Misculini and I want to thank him a lot. Many thanks also to Maurizio Marion for the second picture, to Giancarlo Raposo for the fourth and the fifth pictures, to Roberto Grando for the picture number 6, to Roberto Grando for the picture number 13 and 17, to Franco K. for the picture number 14 (taken from the book "Good-bye Trieste" written by Vladimiro Lisiani), to Giorgio Grisilla and Dennis Tarlao for all the others and for so many details about these plates!